Aside from his weekly adventures on The Chase, eagle-eyed viewers may have seen Paul on other TV shows, and he actually appeared on BBC1’s The Stand up Show as long ago as 2001. Since then he has made scattered appearances on various “talking heads” shows, comedy showcases including The Comedy Store, and appeared on Jason Manford hosted It’s a Funny Old Week in 2015. Then, in 2016, came the highlight, following Beverley Knight onstage to perform on Tonight at the Palladium. Paul’s voice has been frequently heard on Radio 4. He has made frequent appearances on longstanding Radio 4 monuments, The Now Show, Just a Minute, and The News Quiz. Solo projects have included authored documentaries on British quizzing, and the caste system. In 2011 he made the move to factual entertainment. This led to one-off shows about cricket, the 2012 Olympics and Magna Carta. In 2013 his series Paul Sinha’s Citizenship Test took a look at Britishness. 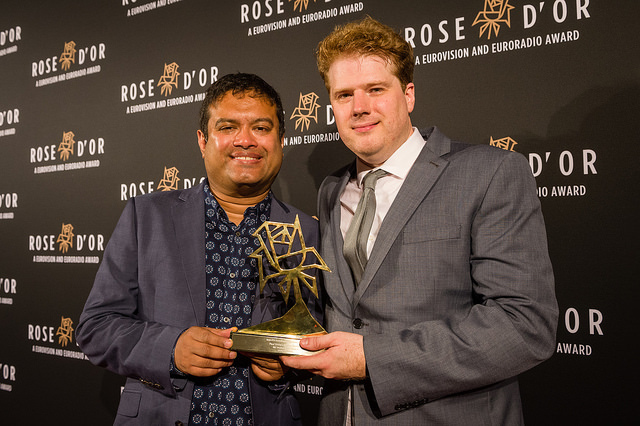 In 2015 Paul recorded the first of three series of Paul Sinha’s History Revision, and in 2016, on a slightly surreal night in Berlin, the show won the prestigious Rose D’or for Best Radio Comedy. Happily the show can now be purchased, using this link. Since 2016 Paul has represented “The South” on Radio 4 quiz show Round Britain Quiz. In addition to his work on Radio 4, Paul is something of a fixture on Radio 5’s flagship sports panel show Fighting Talk, and was series champion in 2015 and 2016.